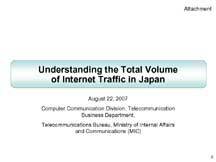 First - go read this pdf of an August 22, 2007 PowerPoint presentation on the Japanese Ministry of Internal Affairs and Communications website. Impressed? You should be. This is fascinating stuff. In Japan, FTTH customers get 100Mbps bidirectional service for about the same that US customers are paying for less than 10Mbps downstream (and even less upstream). A day rarely passes that another North American service providers doesn't make a statement about 1Mbps/10Mbps/25Mbps being plenty. Even industry gadfly Om Malik dares to ask "what would you do with 100 megabits/second connection if you had one". More on that later - first let's take a look at this fascinating study and see how the Japanese are utilizing their bandwidth. The average downstream internet traffic in Japan is over 720Gbps. That's the average, not the peak. Based on the other information in the document, the peak is easily in excess of a Terabit per second. 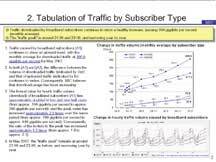 (Other sources report that the median downstream speed per user in Japan is 61Mbps.) This is an increase of 1.4 times in a single year. So while all of those hockey-stick internet drawings of the late 90s may not have been true, there's no leveling off either. This is good news for those of us still in the telecommunications industry. Slide #4 (labeled #3) has another fascinating set of facts. 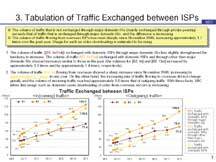 The incoming traffic to Japan has increased 1.7 times in the last year while outgoing traffic has remained relatively static. This implies that, while internet usage and on-line consumption has increased, content generation in Japan has not. That's not a pretty place to be if you're an information-technology based economy. Another interesting question that it raises is around ad placement. If you're trying to reach the Japanese consumer, where do you place your ads? Increasingly, that answer may not be with Japanese websites. Again, not a pretty place to be for Japanese businesses. So, back to the question way up in the second paragraph. What would US consumers do with a 100Mbps connection? The answer right now is probably "not much more than we currently do", and that's because our infrastructure isn't geared to handle it. However, if we did manage to step up the the plate and treat our data infrastructure like our transportation infrastructure and build the highways required to go from 35mph up to 70mph or more, then US consumers would probably use their bandwidth in ways very similar to our Japanese counterparts. In Japan, the applications have followed the bandwidth. Once you can assume that customers have at least 50Mbps to their homes, new services can be offered. Can you imagine what all those Web 2.0 entrepreneurs could come up with if they could be assured of 100Mbps to prime customers? Can you imagine what game designers could do with that bandwidth? Can you imagine what Google - or even Microsoft - could develop that utilizes 100Mbps? Sure it's a chicken and egg problem. Without the bandwidth the applications don't develop and without the applications the bandwidth providers claim there's no demand. But look at the numbers from Japan. With public policy assistance, the bandwidth came first. The applications - and the utilization of the bandwidth - is following along quickly.